Dont worry! Elizabeth was tired of hearing this. Everyone was always telling her to stop worrying, and with good reason  she was always worrying. About everything! She spent hours thinking about all the things that could go wrong. Some of the disasters were possible, just not very likely: her parents could get divorced, she could fail all of her classes, or someone in her family could get sick or injured. She also worried about smaller problems: something could go wrong at a party or someones feelings could get hurt. Elizabeth told a doctor about her stomachaches, headaches, and difficulty sleeping. The doctor told her she had migraines, but she worried that there was something even more serious wrong with her. Fear is a normal, healthy part of the human experience. It is an appropriate response to threats, challenges, and potential loss. Every day, fear encourages you to study harder for tests, reminds you to get college applications in on time, and makes you take reasonable safety precautions. But when fear is excessive, out of proportion to the threats, and causes excessive worry about future events that are not likely to happen, the result is anxiety. 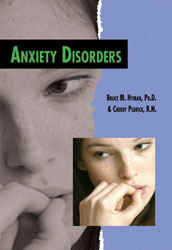 When anxiety persists and interferes with daily life, an anxiety disorder may be diagnosed. Todays treatments offer tremendous hope for people with anxiety disorders. Once people learn and master the skills, they can emerge healthier and more able to withstand the challenges of life.